The plan seeks to address the surge in drug-affected babies born in Maine, but critics say forcing medical professionals to turn in mothers would create a disincentive for women to get prenatal care. AUGUSTA — The majority of members of a legislative committee voted Monday to reject a LePage administration bill to require doctors, drug treatment providers and other professionals to report pregnant women suspected of drug abuse. The 8-5 vote came after doctors and substance experts warned that some pregnant women struggling with addiction might avoid going to the doctor altogether for fear of losing custody of their child at birth. But while a LePage administration official downplayed those concerns – casting the mandatory reporting as “a way to shake things up” – lawmakers struggled Monday with how best to address the surge in drug-affected babies born in Maine. Five committee members who were absent – three Democrats and two Republicans – will have 24 hours to cast their votes on the bill before it is sent to the House and Senate for consideration. The number of newborns who experienced symptoms of drug exposure increased more than fivefold from 2006 to 2016, when 8.2 percent – roughly 1 in 12 – of the 12,478 babies born in the state were deemed to be “drug-affected.” Babies born to mothers addicted to opioids experience withdrawal and sometimes have to be treated with the same medications as a recovering addict. Under current law, doctors already are required to notify the Maine Department of Health and Human Services when they suspect a baby was “born affected by illegal substance abuse” or when a baby may require treatment for exposure to legal substances, including alcohol. The proposal from Gov. Paul LePage would have expanded that mandatory reporting law to when doctors and other professionals – including substance abuse treatment providers – suspect a pregnant woman is abusing drugs or alcohol. Fifteen states require health care workers to report suspected drug abuse during pregnancy, and three states – Alabama, South Carolina and Tennessee – have made drug abuse during pregnancy a crime, according to a 2015 report by the investigative journalism organization ProPublica. 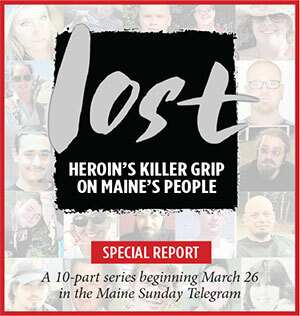 As originally written, the LePage proposal appeared to violate federal health privacy laws that prohibit drug treatment providers from sharing information about patients except in very narrow circumstances. But while the bill’s sponsor, Rep. Frances Head, R-Bethel, proposed an amendment to address those concerns, the changes didn’t sway the staunch opposition from doctors and the medical community, who warned the bill could have “devastating” impacts by undermining patients’ trust in their doctors. Doctors say it is important that pregnant women receive treatment rather than subject their unborn babies to the stress of withdrawal or continued drug abuse. One of LePage’s senior policy advisers, David Sorensen, sought to undercut such claims that reporting would create a disincentive for mothers to seek prenatal care. Appearing on LePage’s behalf, Sorensen suggested that the steadily rising number of drug-affected babies shows that expectant mothers abusing drugs during pregnancy are still choosing to deliver their babies in Maine hospitals, despite the current mandatory reporting requirement. “To me that’s not a very convincing argument, especially when on the other side you have all of the experts weighing in,” Hamann said. Lawmakers are struggling with how to respond policywise to an opioid epidemic that killed 376 Mainers last year. While overdose deaths from heroin and prescription opiates are up nationwide, Maine has seen some of the largest annual increases in the nation in recent years, according to a comparison of federal data. At one point during Monday’s work session, Rep. Deborah Sanderson, R-Chelsea, and other bill supporters noted that getting women into drug treatment or assistance programs while they are still pregnant will help both them and their babies. Newborns of women abusing drugs and alcohol can suffer from severe and sometimes life-threatening withdrawal symptoms after birth.